Glutamic acid decarboxylase autoantibodies (GADA) are the most frequent beta-cell-specific autoantibodies in type 1 diabetes and in latent autoimmune diabetes in adults (LADA). The autoimmune attack on pancreatic islet cells is associated with a T helper 1 cell (Th1) response, mainly represented by IgG1-subclass in humans. It has been proposed that the presence of IgG4 may be associated with a Th2 response. The aim of our study was to compare the GADA IgG-subclass distribution between adult patients with type 1 diabetes and LADA. Patients with type 1 diabetes (n=45) and patients with LADA (n=60) were included. Radioimmunoprecipitation assay with IgG-subclass specific Sepharose (IgG1, IgG2, IgG3 and IgG4) was used to precipitate the antibody/antigen-complex. We only detected IgG4-subclass of GADA in subjects with LADA (26.7%; p<0.001). IgG1 was the most common GADA-subclass in both groups, however IgG1 as the solely expressed subclass was more common among type 1 diabetic patients (77.8%; p<0.05). The rank order of the frequencies of IgG-subclasses in type 1 diabetes was IgG1>IgG3>IgG2>IgG4 and in LADA patients IgG1>IgG4>IgG2>IgG3. The difference in GADA IgG-subclasses could indicate a different immune response, possibly an altered balance between Th1 and Th2 cytokine profile in pancreatic islets. This difference could contribute to the slower rate of beta cell destruction in LADA patients, as reflected by a higher C-peptide level at clinical onset. 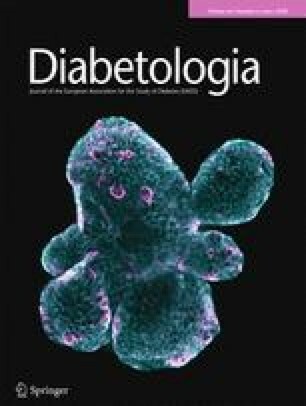 Autoantibodies directed against glutamic acid decarboxylase (GADA) and beta-cell-specific tyrosine phosphatase (IA-2A) are frequently found in patients with type 1 diabetes mellitus and latent autoimmune diabetes in adults (LADA). Patients with LADA have a slower progression of beta cell destruction than patients with type 1 diabetes, which is reflected by the higher C-peptide levels found at diagnosis in LADA patients . The phenotype of LADA tends to resemble classical type 2 diabetes, with patients older at clinical onset, with higher BMI, no initial requirement of insulin treatment and more pronounced insulin resistance . Somehow the beta cell destruction in LADA seems to be less aggressive than in type 1 diabetes. The genetics of LADA and type 1 diabetes with onset in adulthood are similar according to the HLA-system , even though patients with LADA have a lower frequency of risk genes than patients diagnosed with type 1 diabetes in childhood . Another difference between LADA and type 1 diabetes is that LADA patients are more often positive for a single autoantibody, while patients with type 1 diabetes mostly have several autoantibodies [5, 6]. It is possible that the immune system responds differently in the two forms of autoimmune diabetes. Type 1 diabetes is associated with a T helper 1 cell (Th1) cytokine profile [7, 8, 9], in which IgG1 is the dominating GADA-subclass in humans [8, 10]. In mice beta cell destruction is related to a Th1-associated response , which is associated with the production of IFN-γ, TNF and IL-2, but also with the generation of IgG2a and IgG3 . IgG4 is more likely to appear together with the cytokines IL-4, IL-5 and IL-13, which are related to a Th2 response [12, 13, 14]. Our hypothesis is that the profile of IgG-subclasses will reflect the relative balance of T cell subsets and degree of immunogenicity in the destructive process. The aim of our study was to determine the IgG-subclasses of GADA in patients with type 1 diabetes and LADA and compare the IgG-subclass profile as a reflection of T helper cell response against beta-cell-specific antigens in the two types of autoimmune diabetes. Subjects included in this study were clinically classified by the treating physician as having either type 1 or type 2 diabetes. Type 2 diabetic patients with antibody positivity for either one of GADA, islet cell antibody or IA-2 were considered to have LADA. All the patients were above 15 years of age at clinical onset and were diagnosed between 1995 and 2001 in former Malmöhus läns landsting, southern Sweden. The plasma samples were collected as close to diagnosis as possible (clinical data, see Table 1). A control group (n=119; median age 30 years; range 19–65 years) consisting of healthy blood donors was used to determine the cut-off level for the respective IgG-subclass. All control subjects signed a form giving informed consent. This study was approved by the Ethical committee at Lund University (LU-44–95 and LU-526–00). where Std stands for standard. The upper limit for negativity for IgG1 was an index of 0.04, for IgG2 an index of 0.12, for IgG3 0.11, and for IgG4 an index of 0.06, and was calculated as mean + 3 standard deviations. The inter-assay variation coefficients were determined as 19% for IgG1, 17% for IgG2, 24% for IgG3 and 21% for IgG4. The intra-assay variations for each subclass were determined as 10% for IgG1, 6% for IgG2, 13% for IgG3 and 12% for IgG4. We analysed C-peptide using a commercial radioimmunoassay kit (Euro-Diagnostica, Malmö, Sweden) at the Department of Clinical Chemistry, University Hospital of Lund, Sweden. The intra-assay variation was 5% in the measurement interval 0.5–3.5 mmol/l and total variation (sum of intra- and inter-assay variation) was 7% in the same measurement interval. The detection limit was 0.13 nmol/l and the reference interval was 0.25–1.0 nmol/l. Some of the patients were analysed in the fasting state, while others were analysed after eating. However, there is no marked difference in fasting and non-fasting C-peptide levels in patients with autoimmune diabetes . The antibody status, age and type of diabetes were analysed by the statistical package for social sciences (SPSS for Windows version 11.5; SPSS, Chicago, Ill., USA) and Statistics for Biomedical Research (MedCalc for Windows version 7.2). Differences between frequencies were estimated with the chi square test or fisher’s exact test. Differences in autoantibody levels between groups were compared with the Mann–Whitney U test. The Spearman rank correlation test (r s ) was used to test for correlations in levels. Results were considered significant when two-sided p values were less than 0.05. IgG4 was the second most frequent subclass detected in LADA patients (26.7%) while it was not detected at all in patients with type 1 diabetes (p<0.001) (Table 1; Fig. 1). The rank order of the frequency of GADA IgG-subclasses in LADA patients was IgG1>IgG4>IgG2>IgG3, whereas in patients with type 1 diabetes it was IgG1>IgG3>IgG2>IgG4. The distribution of IgG2 and IgG3 was similar in both groups (10.0–13.3%) (Table 2). IgG1 was the most frequently occurring subclass in GADA-positive patients in both groups, found in 83.3% (50/60) of the patients with LADA and in 95.6% (43/45; p=NS) (Table 2) of the patients with type 1 diabetes. When IgG1 was the only subclass, it was less common in patients wih LADA (56.7%, 34/60) than in those with type 1 diabetes (77.8%, 35/45; p<0.05) (Table 3). There was no significant difference in total GADA between LADA patients (median 0.77; range 0.2–1.47) and type 1 diabetic patients (median 0.78; range 0.08–1.61). Most patients with type 1 diabetes expressed IgG1 only, and only 17.8% (8/45) of them had several subclasses of GADA IgG, compared to 28.3% (17/60) of patients in the LADA group (Table 2). This was mostly due to the higher frequency of IgG4 in LADA patients, 16 of whom were IgG4-positive. Some patients had very low concentrations of GADA antibodies when analysed with our standard method for total GADA IgG. Consequently, in 4.4% (2/45) of the type 1 diabetic and in 13.3% (8/60) of the LADA patients, IgG-subclasses were not detectable (Table 3). The C-peptide levels were higher in patients with LADA (n=56; median 0.57 nmol/l; range 0.14–1.80 nmol/l) than in patients with type 1 diabetes (n=45; median 0.28 nmol/l; range 0.13–2.50 nmol/l; p<0.001). Patients with LADA also had a higher median age (see Subjects). However, in IgG4-positive patients there was no correlation either between the levels of IgG4 and C-peptide (r s =−0.148; p=NS) or between IgG4 and age (r s =0.374; p=NS). We found that the IgG4-subclass of GADA was more prevalent in LADA patients than in adult patients with type 1 diabetes, with IgG4 found in about 30% of the former, but being absent in type 1 diabetic patients. However, when IgG4 was found, it was always co-expressed with IgG1-subclass. IgG1 was detected in all (i.e. type 1 and LADA) patients in whom subclasses were identified. To our knowledge, the present study is the largest one to analyse IgG-subclass against GAD65 in LADA patients and in adult type 1 diabetic patients. The method used, however, has not yet been subjected to international standardisation. Previous studies on IgG-subclasses against GAD and IA-2A have been done in type 1 diabetic patients and in autoantibody-positive first degree relatives of such patients [7, 8, 10, 13, 18], but only limited data from LADA patients have been reported . Since both GAD65 and IA-2 are expressed in beta cells and exposed to the same immune cells, the isotype restriction can be expected to be similar. IA-2A restricted to the IgG4-subclass have been shown to be associated with protection from type 1 diabetes  and GADA IgG4 have been shown to be associated with slower progression to clinical diabetes , as our study confirms. GADA IgG4 have also been found in pre-diabetic patients and individuals with non-progressing diabetes [10, 13], corresponding with the milder T cell response that is thought to occur in these subjects. In contrast to our finding that GADA IgG4 was detectable only in LADA patients, this subclass has previously been found in early type 1 diabetes [8, 10, 13]. This could be explained by the possible influence of different methods on the finding of IgG4 in low titres. One study showed that 90% of Chinese type 1 diabetic patients exhibited two or more IgG-subclasses directed against IA-2 , while we found that it was more common for patients with type 1 diabetes to express GADA IgG1 only. In some patients (two in the type 1 diabetes group and eight in the LADA group) IgG-subclasses were not detected at all, even though all the patients with non-detectable GADA IgG-subclasses had low titres of total GADA (index 0.08–0.19; limit for negativity <0.08). This might be explained by the presence of many different subclasses in levels below the detection limit. In mice, IFN-γ and IL-2 from Th1 lymphocytes stimulate the production of IgG2a and IgG3, whereas IL-4 and IL-10 from Th2 lymphocyte stimulates the synthesis of IgG1 and IgG2b [7, 11]. In humans there is no well-defined relation between IgG2 and IgG3 and specific T cell subsets or cytokines. However, it has been suggested that IgE and IgG4 are associated with a Th2 -response [7, 13]. Therefore, results from animal experiments cannot be used directly to interpret findings in human subjects and we cannot conclude whether the immune response in human diabetes is Th1- or Th2-related merely on the basis of the IgG-subclass distribution. One way of further clarifying the results would be to measure the cytokine concentrations, as well, but this would have to be performed in the local organ, since analyses in sera or plasma do not elucidate where the cytokines originate. Th1 and Th2 coexist in the same individual  and may influence cytokine findings in blood. For example, a virus infection that is Th1-dominated results in the release of Th1-related cytokines such as TNF and IFNγ. Allergy and asthma on the other hand are Th2-dominated and patients with coexisting allergies might have elevated levels of IL-4, IL-5 and IL-13 in sera. If cytokines are used as markers for Th1/Th2 dominance, they should preferably be measured directly in the tissue where the cytokines are released and not systemically in the circulation. We found a dominance of IgG1 in type 1 diabetic and LADA patients, and this is likely to reflect a dominant Th1 response against GAD65 in pancreatic tissue. Differences in IgG-subclass distribution against GADA and IA-2A among patients with type 1 diabetes have been reported and IgG1 is the most frequently occurring subclass in all studies so far [8, 13, 19, 21, 22]. However, little is known about the IgG-subclasses in patients not classified as type 1 diabetic. The level of IgG3 varies considerably between studies, which could be partly explained by the fact that this subclass is not as stable as the other subclasses. In vivo IgG1, IgG2 and IgG4 circulate for about 21 days while IgG3 degrades after about 7 days. The handling time of the sample could vary and influence the level of IgG3 to a greater degree than for the other subclasses. Even if the Th1/Th2 paradigm were an oversimplification [23, 24], it is highly likely that Th1 cells and their related cytokines accelerate the destruction of pancreatic beta cells. Some studies have suggested that the Th2 profile in some way is protective against the aggressive damage inflicted on the insulin-producing cells [25, 26, 27, 28, 29]. Furthermore, in our study the LADA patients, who expressed more IgG4, also had better preserved beta cell function at clinical onset. Of course, this could be because patients with LADA have higher expression of Th2 cytokines in the pancreatic tissue, not high enough to be entirely protected but sufficient to slow down progression to beta cell failure. It is still unclear whether the presence of IgG4 predicts better preserved beta cell function in LADA patients in the time after clinical onset, and further studies will be needed to clarify this. We conclude that in some patients with LADA the presence of the IgG4-subclass against GAD65 is an indication of a more balanced immune response in the pancreatic tissue. The dominance of IgG1 in type 1 diabetes represents a more aggressive Th1-dominated reaction. This study was funded by the Swedish Medical Research Council (K97–19x-12242–01A), funds from Region Skåne and the University of Lund (ALF), Stig Almén’s Foundation and the Juvenile Diabetes Foundation / Wallenberg Foundation. We are grateful to Birgitte Ekholm, Malin Johannesson and Ulrika Olsson for excellent technical assistance.